School teachers know a great thing when they see it, which is why cubbies have long been used in elementary schools. But the humble cubby has come a long way from kindergarten classrooms. Now they're almost a dream come true, at least as it applies to organizing hard-to-store items. What makes cubbies so special for home storage solutions is their customizable nature. You might think that if you've seen one, you've seen them all. Not so! There are large ones and small ones, square ones and rectangular ones and even tiny little cubbies that tuck inside a drawer. You've seen shoe organizers. Unfortunately, most of them are flimsy things that hang on the back of a door. That's not especially attractive, and not all shoes fit in them anyway. But imagine if you had a wall of perfectly-sized cubbies made for all of the shoes that you've got. Because cubbies can either be stationary or adjustable, your shoe-storage options just expanded greatly. Think about a small column of shallow cubbies made for all of the flip flops and sandals that you'll wear this summer. And the larger cubbies for those amazing leather booties that you found at an end-of-season sale? Taller cubbies give them an ideal home. For every shoe, there's a cubby where it can breathe and rest without being crushed or put in the way on the floor. Have you ever struggled to find a certain folded shirts from the laundry in a drawer because it was buried at the bottom of a stack? With cubbies, everything is in plain view. You can see at a glance what you've got and where it's located, so the search is finally over. You'll also have the added benefit, of your shirts not sliding off the stack as they would on a standard shelf (without side supports). 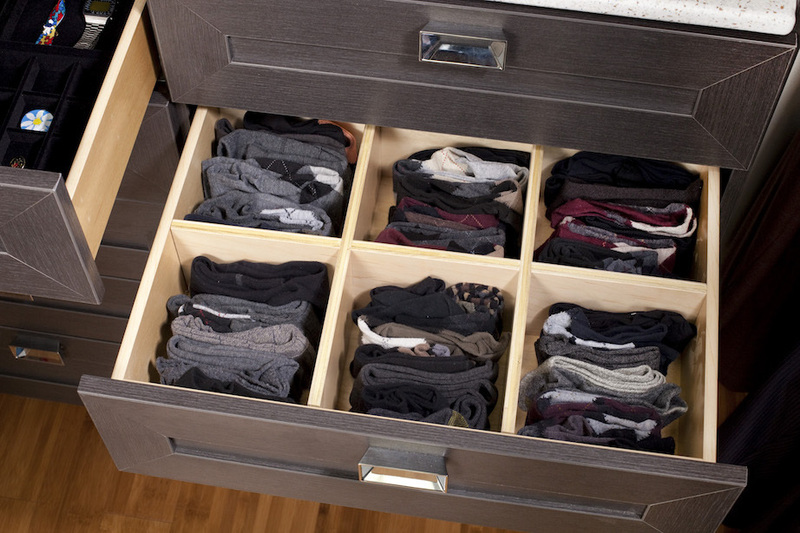 Stacking folded clothes in cubbies makes terrific sense for tidiness, too. There's a reason why clothing stores use them for storing and displaying jeans and T-shirts. Because these items are not hidden in drawers, you can clearly see what you have and grab what you want. The vertical sides of the cubbies keep everything neat and tidy. As pricey as they can be, handbags don't get a lot of respect once they're put away for the day. Some storage systems give you hooks for hanging. That explains why purse straps crease and sometimes separate, which ruins the look of the whole bag. Maybe your bags are put on a shelf. But lets face it, that's a sloppy looking solution and you run the risk of scratching one bag with another bag's buckle when you pull it out of the haphazardly placed bags. 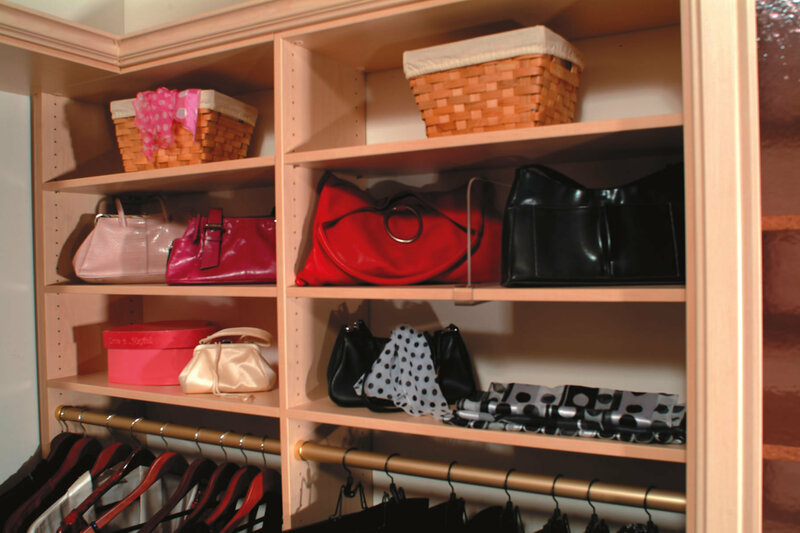 Cubbies make ideal handbag storage spaces. From the tiniest beaded clutch to the biggest leather shoulder bag, customizable cubbies win again. No storage space is wasted because each cubby can be adjusted to be the perfect dimension for the bag that it holds. And you'll never have to worry about the snagged sequins or scuffed leather issues that happen when bags are stacked up on a shelf. Tie and belt racks are great, but not every person likes to hang their ties and belts on a rack. Some fastidious folks like to roll their expensive ties, and nest them gently in a drawer mounted cubby system (which we call an egg-crate) to keep them neat, unstretched and dust free. Also, all belts are not best suited for hanging. What if you have belts with large ornate buckles? You can easily store up to 20 or more in a 4 inch high drawer. With cubbies, you can customize a couple of drawers and keep these expensive items in good condition and easily accessible. Similar setups can be used for socks, underwear, hosiery, and lingerie. Maybe they don't come from Cartier, and maybe they're not made from platinum and diamonds. But good costume jewelry pieces are definitely not cheap. That's why it's such a shame to find chains tangled up with bangles, and the dreaded lost earring back. 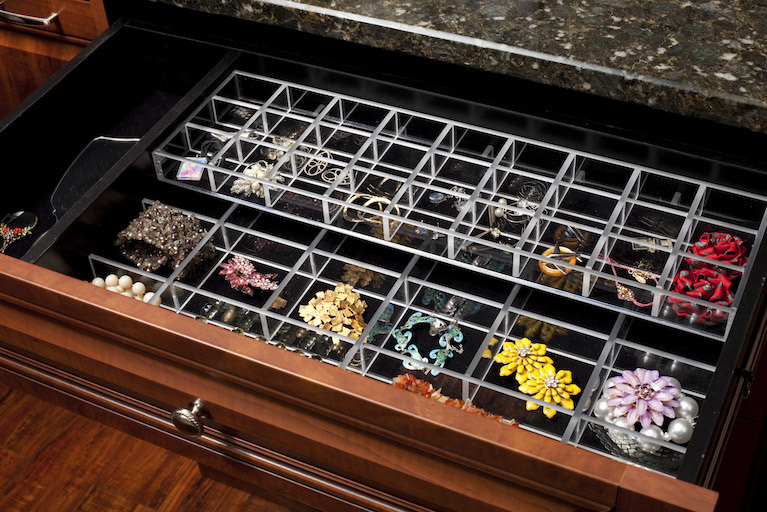 Small jewelry cubbies transform a series of drawers in your closet organization system into into a jewelry chest. You can create amazing jewelry storage cabinets where the backs of the doors are perfect for hanging necklaces, and the drawers behind the doors can be set up for storing any type of jewelery from rings to bracelets to watches and cufflinks. Cubbies have certainly gone through an impressive upgrade. They're still perfect for stacking up homework in a classroom. But they're coming into their own as home storage solutions, too. And the Closet Works is your go-to source for finding exactly what you need. It's not that we stock so many different kinds. It's that we work closely with you to design the ideal, high-quality solution for your needs, and we build it the way that you want it. All that, and it's affordable, too. Often more affordable -- and more sturdy -- than anything you'd buy off the shelf. Now that your imagination is sparked, take the next step and schedule a free design consultation. 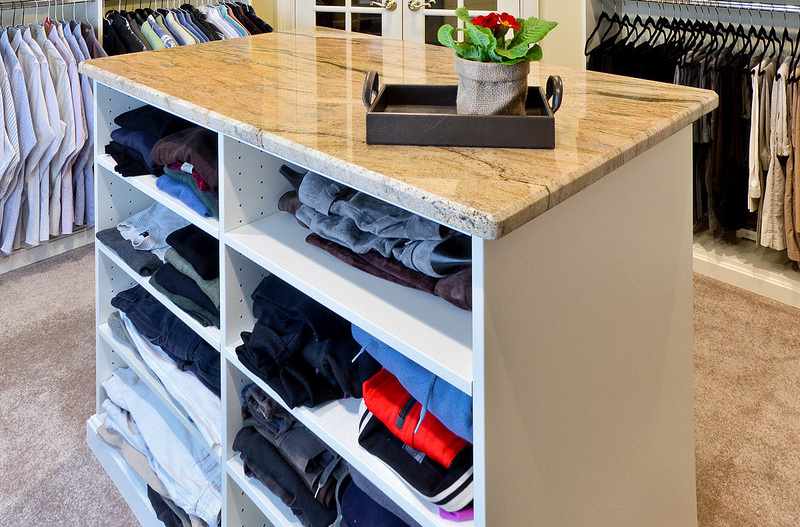 Your closet really can be an organizational wonder, and the not-so-humble cubby plays a major role.